Nature in Karula National Park (total area 123 sq. km) is very versatile. In the northern part of the national park prevail semi-natural landscapes which have emerged as a result of millennia of human activity. Here sparsely situated farms alternate with strips of fields, pastures, forests and lakes. Most of the national park’s population has concentrated in this area. The southern part of the national park is covered with huge expanses of forest with smaller bogs and mires in-between. 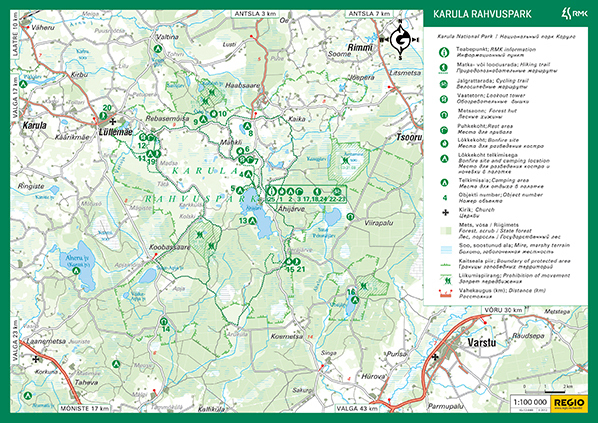 Karula National Park boasts the largest forest mass in Southeast Estonia, stretching far beyond the national park’s borders. More than 70% of the national park’s area is covered with forest. With glacial retreat numerous lakes emerged in the hilly Karula area, 38 of which are located within the borders of the national park. The largest of the lakes is Lake Ähijärv (176 ha) with its rambling shoreline, and the deepest is Lake Savijärv (18 m). The Centre for State Forest Management has been responsible for Karula National Park’s visitor management since February 2009. Attractions Scenic Lake Ähijärv, Rebasemõisa Tornimägi (137.8 m above sea level), undulating landscape. Activities Hiking and cycling, camping, nature education, adventure tourism, fishing, nature photography. Visitor restrictions Please see the visitor restrictions established in Karula National Park here! Files A brochure of the National Park was issued by Environmental Board. Download PDF.